Rhythm is connecting. Each participant listen attentively, act, react, get involved individually and at the same time stand behind the common goal - The overall composition. African drums impress with their immense diversity and forms of expression which is probably also why the fascination for African rhythms became so widespread in Europe during the 1980s. Playing in a group with different rhythms which all complement each other creates a sense of togetherness. The rhythm sequences require coordinated playing as only the group as a whole can join these individual elements to form a complete melody. In drumming, the participants' awareness of themselves and the group members also increases. It is a process of social learning in the group. Rhythm is a language which can express feelings and rhythm as speech form promotes communication. Drumming does not require any prior musical knowledge or talent! With the original and traditional teaching of the west African rhythms you will experience an intense and inspirational insight into the world of drums. 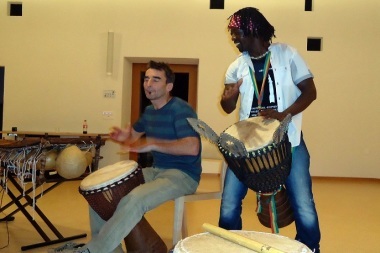 Massa Koné, a talented djembe and balafon teacher who comes from a family of musicians in Mali, will impress with his exceptional expertise and playing techniques − his playing is full of life and intensity! All materials, drum rental, instructions and supervision by Massa Koné. 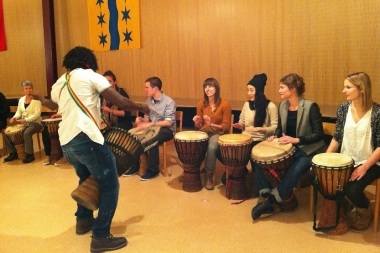 Drumming as a team building event. Everyone drums for themselves as individual and yet you are still part of the whole − similar to the business world.